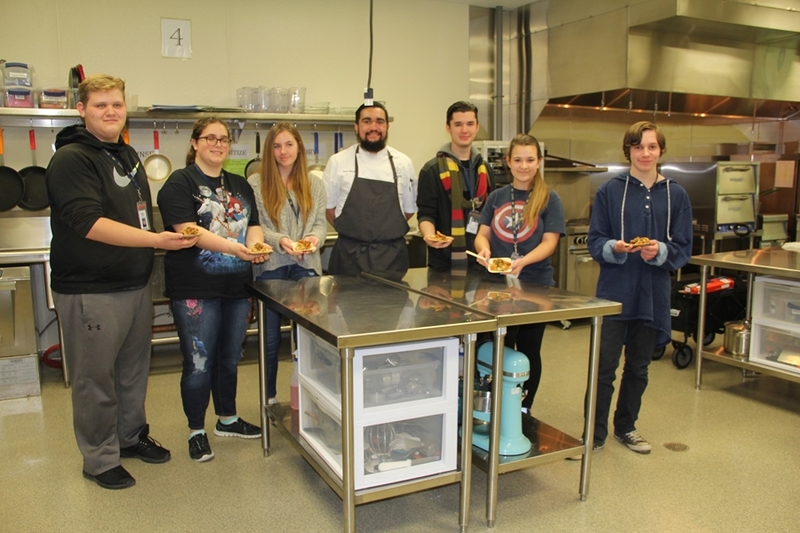 Food and culinary sciences student Sergio Herrera (center) spoke to culinary students at Bentonville West High School about how food, science, chemistry, sensory and safety all come together in the food industry. FAYETTEVILLE, Ark. – Like many students, Sergio Herrera had an idea of what he wanted to study when he went to college, but he wasn't aware of the many options and potential careers. A first-generation student whose parents are immigrants from El Salvador, Sergio grew up in Springdale and has always been interested in food and culinary arts. Following different experiences, he decided being a chef in a restaurant wasn't his ultimate goal. After graduating in 2017 from Brightwater: A Center for the Study of Food, a division of NorthWest Arkansas Community College providing culinary arts training, he is focused on working for a large corporation, and possibly traveling around the world, learning about food trends and production. "My love of food science became clear when I learned how a food scientist can blend and tag team with culinary arts to make a wonderful consumer-friendly food product," said Herrera. That realization led him to the Department of Food Science in U of A's Dale Bumpers College of Agricultural, Food and Life Sciences. Food Science offers a food and culinary sciences concentration, which combines food science and culinary arts. The four-year program provides students with a food science degree that includes 21 hours of hands-on culinary arts classes provided through a partnership with NWACC. The culinary classes are held at Brightwater. Is the program challenging? "Absolutely," said Herrera. "But I love it." He currently has an internship at Tyson Foods as a poultry category culinary trainee. He's so excited about the program and his future, when he's not at Tyson or in class, he speaks to high school students about food science careers. Herrera recently visited the class of Audra Weeks, a culinary instructor in career and technical education at Bentonville West High School where he shared with students how science, such as chemistry, food safety and food sensory, are all essential in creating a desirable food product. He also showed students how to select visually pleasing ingredients to create an appealing presentation for consumers. When he finishes the program, Herrera will be eligible after continued training to become a certified research chef or a certified culinary scientist through the Research Chef's Association.